Dry eye disease (DED), a disease of the lacrimal functional unit, is a complex autoimmune-based chronic inflammatory condition that can have a significant negative impact on quality of life and the patient’s ability to effectively carry out everyday activities. Further, DED may lead to contact lens intolerance, and may adversely affect refractive surgical outcomes and be associated with post-ocular surgery complications. The ocular surface system is in constant dynamic equilibrium; however, if damage is severe or too prolonged, repair mechanisms can fail, initiating a feedback loop of increasing inflammation known as the ‘vicious cycle’. Stress to the ocular surface triggers the initial inflammatory events that lead to autoimmunity; autoantibodies may contribute to complementdependent ocular surface pathology. With an aging population and with lifestyles becoming increasingly dependent on screen technology, the burden of DED is likely to escalate in the future. There are multiple challenges in the management of DED, not least the lack of medications for chronic use. The publication of this article was supported an Independent Educational Grant from Shire. The views and opinions expressed in the article are those of the authors and not necessarily those of Shire. of antihistamines; depression; use of antidepressants; and osteoarthritis. impact everyday activities and could lead to contact lens intolerance. may be associated with post-ocular surgery complications. have been shown to correlate with disease severity. Lifestyle modifications (e.g. environmental, nutritional, omega 3 supplements). Withdraw any non-required topical/systemic medications. Artificial tear substitutes are always indicated. Autologous serum and derivatives are very useful when indicated. Doxycycline oral/azithromycin topical or oral, for eyelids and cornea. Topical steroids short-term are essential, though an improved safety profile is needed. Topical cyclosporin: prepare ocular surface for tolerance. Topical lifitegrast: limited real-world experience in the US, no experience elsewhere. Systemic immunosuppressants: Sjögren’s syndrome, graft-versushost disease. The most significant challenge is the scarcity of medications available for chronic use. Q: Are there any notable trends with respect to prevalence of DED? effect of pollution on the ocular surface. Q. What are the three top bio markers for DED? may vary depending on the drug. Q. What in general drives patients to your office: signs, symptoms or both? Most patients present because of their symptoms and the impact they have on their lives, for example, their ability to work and drive. Q. If inflammation is under control, do we break the vicious cycle and restore ocular surface heath? Resolution of the disease or at least disease control is possible with long-term suppression of inflammation. For optimal results, we need an anti-inflammatory agent for chronic use (many years). Q. What antigen plays a key role in the vicious cycle? There are two hypotheses: destroyed pathogenic bacteria may release antigens; or TLRs may be activated by DNA segments shredded from apoptosis. Q. When are punctal plugs useful? blepharitis in general and whenever improvement is not observed, the plugs should be removed. 1. Persico J, International Dry Eye Workshop II. Presented at ARVO 2017, 2017. Available at: www.reviewofoptometry.com/article/ zen-and-the-art-of-dry-eye (acessed 22 June 2017). 2. Baudouin C, [A new approach for better comprehension of diseases of the ocular surface], J Fr Ophtalmol, 2007;30:239–46. 3. Baudouin C, Aragona P, Van Setten G, et al., Diagnosing the severity of dry eye: a clear and practical algorithm, Br J Ophthalmol, 2014;98:1168–76. 4. Research in dry eye: report of the Research Subcommittee of the International Dry Eye WorkShop (2007), Ocul Surf, 2007;5:179–93. 5. Baudouin C, Messmer EM, Aragona P, et al., Revisiting the vicious circle of dry eye disease: a focus on the pathophysiology of meibomian gland dysfunction, Br J Ophthalmol, 2016;100:300–6. 6. Aragona P, Rolando M, Towards a dynamic customised therapy for ocular surface dysfunctions, Br J Ophthalmol, 2013;97:955–60. 7. 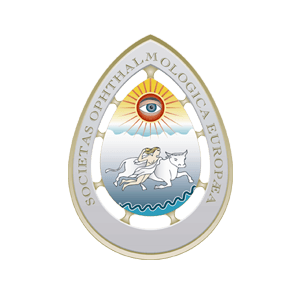 Rolando M, Geerling G, Dua HS, Emerging treatment paradigms of ocular surface disease: proceedings of theOcular Surface Workshop, Br J Ophthalmol, 2010;94(Suppl 1):i1–9. 8. Viso E, Rodriguez-Ares MT, Gude F, Prevalence of and associated factors for dry eye in a Spanish adult population (the Salnes Eye Study), Ophthalmic Epidemiol, 2009;16:15–21. 9. Bjerrum KB, Keratoconjunctivitis sicca and primary Sjogren’s syndrome in a Danish population aged 30-60 years, Acta Ophthalmol Scand, 1997;75:281–6. 10. Malet F, Le Goff M, Colin J, et al., Dry eye disease in French elderly subjects: the Alienor Study, Acta Ophthal, 2014;92:e429–36. 11. Vehof J, Kozareva D, Hysi PG, Hammond CJ, Prevalence and risk factors of dry eye disease in a British female cohort, Br J Ophthalmol, 2014;98:1712–7. 12. Fridman M et al., A Systematic Literature Review and Meta- Analysis of Dry Eye Disease Prevalence Based on 30 Studies From Around the Globe. Presented at: ASCRS 2017, Los Angeles, CA, May 5–9. 13. Uchino M, Schaumberg DA, Dogru M, et al., Prevalence of dry eye disease among Japanese visual display terminal users, Ophthalmology, 2008;115:1982–8. 14. Ofcom Communications Market Report 2016. Available at: www.ofcom.org.uk/research-and-data/multi-sector-research/ cmr/cmr16 (accessed 22 June 2017). 15. Buchholz P, Steeds CS, Stern LS, et al., Utility assessment to measure the impact of dry eye disease, Ocul Surf, 2006;4:155–61. 16. Miljanovic B, Dana R, Sullivan DA, Schaumberg DA, Impact of dry eye syndrome on vision-related quality of life, Am J Ophthalmol, 2007;143:409–15. 17. McDonald M, Patel DA, Keith MS, Snedecor SJ, Economic and humanistic burden of dry eye disease in Europe, North America, and Asia: a systematic literature review, Ocul Surf, 2016;14:144–67. 18. Lienert J, Tarko L, Uchino M, et al., Long-term natural history of dry eye disease from the patient’s perspective, Ophthalmology, 2016;123:425–33. 19. 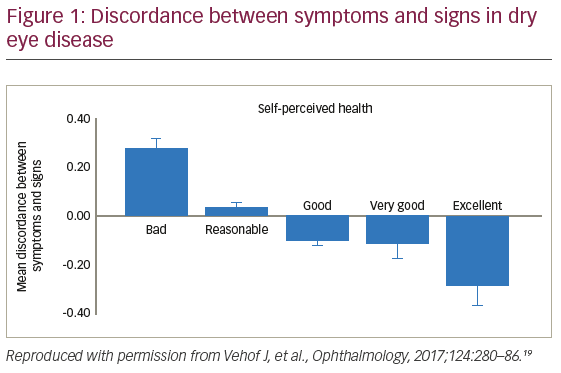 Vehof J, Sillevis Smitt-Kamminga N, Nibourg SA, Hammond CJ, Predictors of discordance between symptoms and signs in dry eye disease, Ophthalmology, 2017;124:280–6. 20. Albietz JM, Lenton LM, McLennan SG, Chronic dry eye and regression after laser in situ keratomileusis for myopia, J Cataract Refract Surg, 2004;30:675–84. 21. Park Y, Hwang HB, Kim HS, Observation of influence of cataract surgery on the ocular surface, PloS One, 2016;11:e0152460. 22. Epitropoulos AT, Matossian C, Berdy GJ, et al., Effect of tear osmolarity on repeatability of keratometry for cataract surgery planning, J Cataract Refract Surg, 2015;41:1672–7. 23. Stern ME, Schaumburg CS, Pflugfelder SC, Dry eye as a mucosal autoimmune disease, Int Rev Immunol, 2013;32:19–41. 24. Peters E, Colby, K, Chapter 3, The Tear Film. In: Tasman W, Jaeger EA (ed), Duane’s Ophthalmology, Philadelphia: Lippincott Williams & Wilkins, 2009. 25. Pflugfelder S, Beuerman R, Stern ME, Dry Eye and Ocular Surface Disorders, (first edn), CRC Press, 2004. 26. The definition and classification of dry eye disease: report of the Definition and Classification Subcommittee of the International Dry Eye WorkShop (2007), Ocul Surf, 2007;5:75–92. 27. Enriquez-de-Salamanca A, Castellanos E, Stern ME, et al., Tear cytokine and chemokine analysis and clinical correlations in evaporative-type dry eye disease, Mol Vis, 2010;16:862–73. 28. Stern ME, Schaumburg CS, Dana R, et al., Autoimmunity at the ocular surface: pathogenesis and regulation, Mucosal Immunol, 2010;3:425–42. 29. 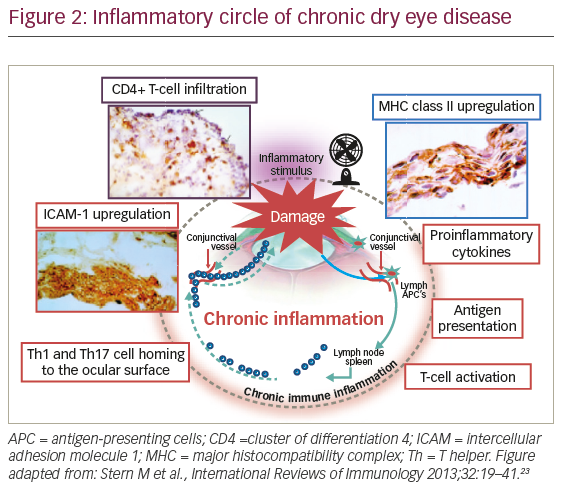 Saban DR, The chemokine receptor CCR7 expressed by dendritic cells: a key player in corneal and ocular surface inflammation, Ocul Surf, 2014;12:87–99. 30. Chauhan SK, El Annan J, Ecoiffier T, et al., Autoimmunity in dry eye is due to resistance of Th17 to Treg suppression, J Immunol, 2009;182:1247–52. 31. de Paiva CS, Villarreal AL, Corrales RM, et al., IFN– Promotes goblet cell loss in response to desiccating ocular stress, Invest Ophthalmol Vis Sci, 2006;47:5579. E-Abstract. 32. De Paiva CS, Chotikavanich S, Pangelinan SB, et al., IL-17 disrupts corneal barrier following desiccating stress, Mucosal Immunol, 2009;2:243–53. 33. De Paiva CS, Villarreal AL, Corrales RM, et al., Dry eye-induced conjunctival epithelial squamous metaplasia is modulated by interferon-gamma, Invest Ophthalmol Vis Sci, 2007;48:2553–60. 34. Dry Eye Syndrome Preferred Practice Patterns of the American Academy of Ophthalmology 2013. Available at: www.aao. org/preferred-practice-pattern/dry-eye-syndrome-ppp--2013 (accessed 26 June 2017). 35. Management and therapy of dry eye disease: report of the Management and Therapy Subcommittee of the International Dry Eye WorkShop (2007), Ocul Surf, 2007;5:163–78. 36. Behrens A, Doyle JJ, Stern L, et al., Dysfunctional tear syndrome: a Delphi approach to treatment recommendations, Cornea, 2006;25:900–7. 37. Pflugfelder SC, Maskin SL, Anderson B, et al., A randomized, double-masked, placebo-controlled, multicenter comparison of loteprednol etabonate ophthalmic suspension, 0.5%, and placebo for treatment of keratoconjunctivitis sicca in patients with delayed tear clearance, Am J Ophthalmol, 2004;138:444–57. 38. Jung HH, Ji YS, Sung MS, et al., Long-term outcome of treatment with topical corticosteroids for severe dry eye associated with sjogren’s syndrome, Chonnam Med J, 2015;51:26–32. 39. Lee H, Chung B, Kim KS, et al., Effects of topical loteprednol etabonate on tear cytokines and clinical outcomes in moderate and severe meibomian gland dysfunction: randomized clinical trial, Am J Ophthalmol, 2014;158:1172–83.e1. 40. Avunduk AM, Avunduk MC, Varnell ED, Kaufman HE, The comparison of efficacies of topical corticosteroids and nonsteroidal anti-inflammatory drops on dry eye patients: a clinical and immunocytochemical study, Am J Ophthalmol, 2003;136:593–602. 41. Pinto-Fraga J, Lopez-Miguel A, Gonzalez-Garcia MJ, et al., Topical fluorometholone protects the ocular surface of dry eye patients from desiccating stress: a randomized controlled clinical trial, Ophthalmology, 2016;123:141–53. 42. Marsh P, Pflugfelder SC, Topical nonpreserved methylprednisolone therapy for keratoconjunctivitis sicca in Sjogren syndrome, Ophthalmology, 1999;106:811–6. 43. Sainz De La Maza Serra M, Simon Castellvi C, Kabbani O, [Nonpreserved topical steroids and lacrimal punctal occlusion for severe keratoconjunctivitis sicca], Archivos de la Sociedad Espanola de Oftalmologia, 2000;75:751–6. 44. FDA News Release, FDA approves new medication for dry eye disease [press release] 12 July 2016. Available at www.fda.gov/ NewsEvents/Newsroom/PressAnnouncements/ucm510720. htm (accessed 17 August 2017)..
45. Donnenfeld E, Pflugfelder SC, Topical ophthalmic cyclosporine: pharmacology and clinical uses, Surv Ophthalmol, 2009;54:321–38. 46. Ikervis, European Medicines Agency 2015. Available at: www. 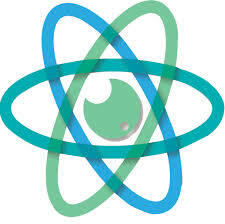 ema.europa.eu/ema/index.jsp?curl=pages/medicines/human/ medicines/002066/smops/Positive/human_smop_000783. jsp&mid=WC0b01ac058001d127 (accessed 26 June 2017). 47. 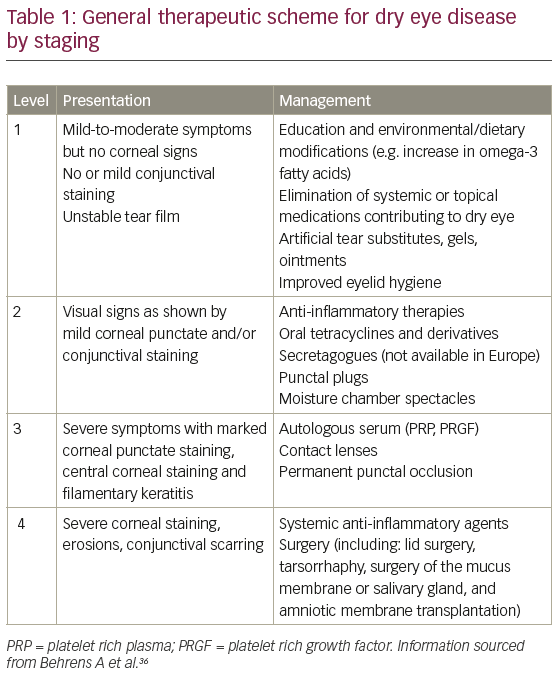 Ames P, Galor A, Cyclosporine ophthalmic emulsions for the treatment of dry eye: a review of the clinical evidence, Clin Investig (Lond), 2015;5:267–85. 48. Sall K, Stevenson OD, Mundorf TK, Reis BL, Two multicenter, randomized studies of the efficacy and safety of cyclosporine ophthalmic emulsion in moderate to severe dry eye disease. CsA Phase 3 Study Group, Ophthalmology, 2000;107:631–9. 49. Moscovici BK, Holzchuh R, Sakassegawa-Naves FE, et al., Treatment of Sjogren’s syndrome dry eye using 0.03% tacrolimus eye drop: Prospective double-blind randomized study, Cont Lens Anterior Eye, 2015;38:373–8. 50. Gao J, Morgan G, Tieu D, et al., ICAM-1 expression predisposes ocular tissues to immune-based inflammation in dry eye patients and Sjogrens syndrome-like MRL/lpr mice, Exp Eye Res, 2004;78:823–35. 51. Stern ME, Gao J, Schwalb TA, et al., Conjunctival T-cell subpopulations in Sjogren’s and non-Sjogren’s patients with dry eye, Invest Ophthalmol Vis Sci, 2002;43:2609–14. 52. Perez VL, Pflugfelder SC, Zhang S, et al., Lifitegrast, a novel integrin antagonist for treatment of dry eye disease, Ocul Surf, 2016;14:207–15. 53. FDA approves new medication for dry eye disease 2016. Available at: www.fda.gov/newsevents/newsroom/ pressannouncements/ucm510720.htm (accessed 26 June 2107). 54. Semba CP, Swearingen D, Smith VL, et al., Safety and pharmacokinetics of a novel lymphocyte function-associated antigen-1 antagonist ophthalmic solution (SAR 1118) in healthy adults, J Ocul Pharmacol Ther, 2011;27:99–104. 55. Sheppard JD, Torkildsen GL, Lonsdale JD, et al., Lifitegrast ophthalmic solution 5.0% for treatment of dry eye disease: results of the OPUS-1 phase 3 study, Ophthalmology, 2014;121:475–83. 56. Tauber J, Karpecki P, Latkany R, et al., Lifitegrast ophthalmic solution 5.0% versus placebo for treatment of dry eye disease: results of the randomized phase III OPUS-2 study, Ophthalmology, 2015;122:2423–31. 57. Holland EJ, Luchs J, Karpecki PM, et al., Lifitegrast for the treatment of dry eye disease: results of a phase III, randomized, double-masked, placebo-controlled trial (OPUS-3), Ophthalmology, 2017;124:53–60. 58. Donnenfeld ED, Karpecki PM, Majmudar PA, et al., Safety of lifitegrast ophthalmic solution 5.0% in patients with dry eye disease: a 1-year, multicenter, randomized, placebo-controlled study, Cornea, 2016;35:741–8.